Because skates in this region live in the same kinds of habitat and fishing gear doesn’t discriminate between them, seven species are managed as a complex. Although recent analyses have a great deal of uncertainty, it appears that a few of these species (even the barndoor skate which was once feared to be nearly extinct) appear to be rebuilding to healthy levels. These species are fished for a large foreign skate wing meat trade. The meat is also used as bait for the region’s lobster fishery. 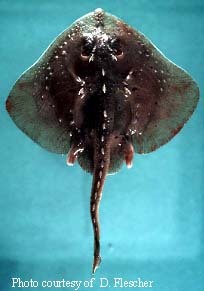 One species, the thorny skate, is classified as Critically Endangered in U.S. waters under the IUCN Red List. Two recent petitions (from the Animal Welfare Institute and WildEarth Guardians) aim to get thorny skates protected under the Endangered Species Act. It’s been illegal for skate fishermen to land thorny skates since 2004, but they’re still often caught as bycatch. Additionally, monitoring is generally quite poor and fishermen usually do not report landings by species despite efforts to gather species-specific data by the skate fisheries management plan. Unless species-specific reporting improves and fishermen come up with a way to avoid catching thorny skates, I join the American Elasmobranch Society, Shark Advocates International, and the Project AWARE Foundation in opposing this increase in the skate fishery. I agree with your comments, think extending the quota also sets a dangerous precedent. Also, what about the creatures skates eat and keep under control. I’m not certain but don’t they eat jelly-fish? Given the current explostion in jelly fish populations across the globe and the pressure it’s put on the fish populations, coupled with over-fishing, the proposal could only add to that problem. Skate diet is not my field, but I’m reasonably certain that they do not eat jellyfish. I think skates live on the bottom and mostly eat molluscs and crustaceans. To my knowledge skates don’t eat jellyfish, though they do eat plenty of squid and herring, which is surprising for a benthic fish with a mouth on the underside. Spiny dogfish do eat comb jellies, and have been identified as a possible major predator of them. These fisheries complexes are a real catch-22; you have a group of species, each with their own individual tolerances of fishing pressure but all in the same area and therefore being caught at the same time. I know skates do have a pretty decent bycatch survival rate (depending on fishing method, temperature, etc.) but offhand I don’t know that anything specific to thorny skates has been done in that area. I guess we’d have to assume that their survivability is about on par with other better-studied species in the complex and hope keeping them as a no-take species is enough. I live in a marine environment too! I will like to support each activity that helps to save nature. Also very worried about the reduction of forests in various parts of the world. I thought Chuck’s comment was right on. Concern is justified, but one needs to ahe nore information on these kinds of environmental issues to make an informed judgement – that is to say the forces for good often paint an unbalanced picture. Perhaps some of your colleagues might want to see what the assessment actually says and what the distribution of thorny skates is outside of US waters and let us know. Frank, the IUCN Red List claims that thorny skates are Critically Endangered in U.S. waters, and are doing slightly better (only “Vulnerable”) globally. However, conservation policies often focused on endangered subpopulations, as they should, and that’s what’s happening here. Oh i forgot to mention, the fact that quotas are being increased could mean that other species normally caught are under threat!! Another issue with skate fisheries is the brutality associated with ‘winging’ the skates. It’s the most brutal thing I’ve seen in commercial fisheries – the skate (which is often very much alive) is held up on a hook and their ‘wings’ are cut off with a large knife. They’re very tough things, skates, and they often show strong signs of being alive as their de-winged bodies are shoved back overboard.